Have you ever gone to a new place where people warmly welcomed and embraced you? A place where people warmly welcomed and embraced everyone? It’s not the location that matters. It’s the people. I’ve been in groups like this. Everyone’s accepted as they are. They don’t need to prove themselves first. They don’t need to pass a screening process or fit an unstated list of expectations. There’s no judgment, condemnation, or rejection. There’s love. Acceptance. Harmony. Unity. This should describe the church. It doesn’t. Most of my experiences where everyone was welcomed and embraced didn’t happen in a church service or at a church building. It happened in spiritual groups outside the church. And it happened with groups that weren’t spiritual at all. This is to our shame. In the various churches I’ve attended in my life, only one warmly welcomed and embraced everyone. Even so, they held some underlying criteria of expectations and behavior. Do people at your church congregate with their friends and ignore others, especially visitors? Do people at your church only hang out with those of their own age, race, and marital status? What about socioeconomic status? Do people who visit your church need to meet some unspoken expectations of acceptable attire, worship, and language? Consider this: someone walks into a traditional mainline church wearing jeans and a T-shirt, shouts “hallelujah” after the prelude, and talks about the Holy Spirit is if he’s their friend. It’s obvious they don’t fit in and won’t find acceptance. Or what about the guy wearing a three-piece suit, sporting slicked back hair, and carrying a leather bound KJV showing up at a hipster millennial church? Yep. He doesn’t fit. And the chance of the church accepting him is slim. At church do you gather with your friends and ignore visitors? At church do you hang out with people just like you, with the same age, race, and marital status? At church do you expect people to look, talk, and act a certain way? 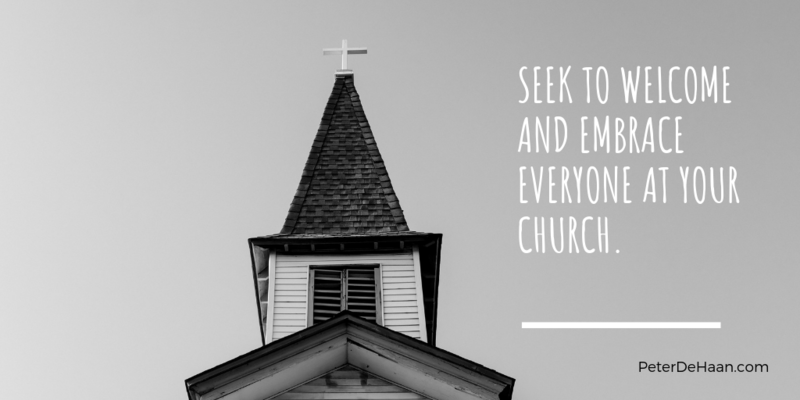 If your church is like most churches, it’s not inclusive. At least it’s not inclusive the way Jesus was inclusive. But you can make a difference, for both your church and for the kingdom of God. You can be personally inclusive. If you’re consistent and patient, given enough time, some people will follow your example—or maybe they won’t. Maybe they won’t appreciate your efforts to include everyone, and then they’ll exclude you. Then you might be at the wrong church. But don’t worry how your church might react to your inclusivity efforts. Instead focus on the reaction of the people you include.